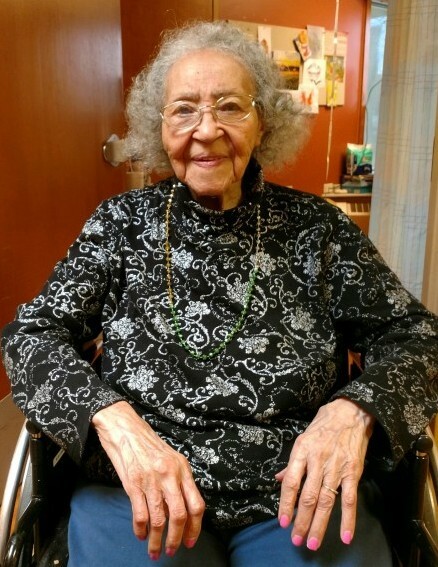 Lerlene Glordine Martin, at a blessed 96 years of age was welcomed by a host of Angels on Thursday, February 7, 2019 as she succumbed to this life at Hackley Hospital in Muskegon, Michigan following a very sudden illness with her family at her side. She was born April 23, 1922 in McNeil, Arkansas to the union of Aaron Gilbert and Minnie Jacobs. She accepted Christ while in McNeil, where she also received her formal education. In 1945 Lerlene met and married her spouse and companion Edward Martin. No children were born to this union. They relocated to Muskegon Heights, Michigan during that same year joining the Queen Esther Missionary Baptist Church under the leadership of the late Rev. W. L. Steward. During her stewardship there Sis. Martin became the very first president of the church’s Nurses Guild. She later moved her membership to Beulah Missionary Baptist Church under the leadership of the late Rev. J.M. Blow, where she faithfully attended Sunday School, Baptist Training Union and Vacation Bible School. She was a member of the Senior Choir for many years and although she genuinely enjoyed singing she would NOT rock! Sis. Martin was very knowledgeable regarding our black heritage and looked forward to sharing her many tidbits of information during Black History Month and other special occasions often garbed in her own unique version of African attire. “Faithful” would be the perfect word to describe the oldest woman in our congregation. It is such a marvelous coincidence that she and Beulah Missionary Baptist Church would have both celebrated 97 years in April. Sis. Martin was employed at Hackley Hospital for over forty years as a Nurse’s Assistant in the O.B. Unit prior to her retirement. She was not a frugal woman but she taught us how to save our money, pay for the things we wanted with cash and how to remain debt-free. A very wise woman walked among us! She leaves to mourn her memories many cousins, including two who tag-teamed checking on her and taking care of her needs; Rolanda Buford , Dewey Russ and Florence Pollard, a long-time friend; Pat Carradine, and her Beulah Baptist Church family. Sis. Martin was preceded in death by her husband of 63 years; Edward Martin, her parents, one brother- Bonnie Gilbert , one sister, four brothers-in-law and seven sisters-in-law.